PATLAB succeeded to establish a laboratory with special modern high quality equipment with excellent technical performance as required by international and European Union norms. The laboratory with the instrumentation is open for cooperation and collaboration with institutes, universities and economic agents for approach of technical and scientific research and development programs. Furthermore Master- and PhD-students from universities (with their supervisors) should feel welcome to use the well-equipped facilities in PATLAB with our expertise as basis for their studies. Currently PATLAB is equipped with the following instrumentation. PATLAB has 5 high level advanced modern research FloPro process analyzer systems suitable for real-time monitoring and PID control. These FloPro instruments are the most versatile commercially available and can be used for advanced research and development projects and method development. As flow-based systems they are ideally suited for the activity domain of PATLAB which is based on research and development of process systems for intelligence interactive monitoring and control and small scale synthesis with advantages of the technology and applications in informatics, industries (oil, gas, petroleum, chemical, mining, pharmaceutical, food, beverages, textile e.g. clothes, surfactants, cosmetics, etc. ), water, pollution, energy, environment, health, agriculture (fertilizers, animal feedstuffs, soil, herbicides, insecticides, farm products etc. ), quality of food and beverages, biotechnologies, innovative products and processes, construction materials (bricks, cement, tiles, wooden materials, paints etc. ), household appliances and consumer products, entertainment (ink, paper, polymer films, liquid crystals, electronic chemicals etc. ), transport, space and security. They can also be used for routine, on-line, and field analyses applications. With their modular design, based on state-of-the-art panel-mounted components, the instruments can easily and quickly be configured to perform essentially any flow-based methodology; or re-configured to change methodologies. A powerful full-feature FlowZF software was designed specifically for flow-based systems by an expert in the field. 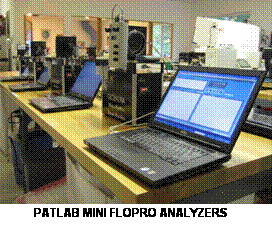 PATLAB is equipped with 1 FloPro and 4 mini FloPro research analyzer systems. The picture gives a global view of the FloPro research analyzer system in PATLAB. Below is a close-up view of the sampling part and process PID controller of PATLAB. 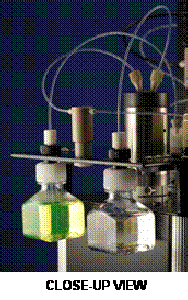 The picture below gives a view of the 4 flowpro mini-zone fluidic process analyzers in operation. 2. 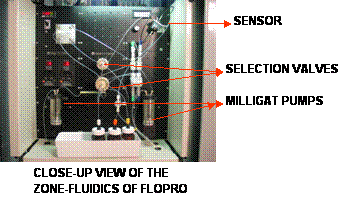 FLOPRO-MINI-ZONE FLUIDICS PROCESS ANALYZER. UV/Vis DETECTION. This mini-FloPro is equipped with a milliGAT pump, 2 selection valves, heated reactor and plumbed for zone fluidics equipped to study a variety of chemistries. An Ocean Optics multi wavelength spectrometer is used for UV/vis detection. 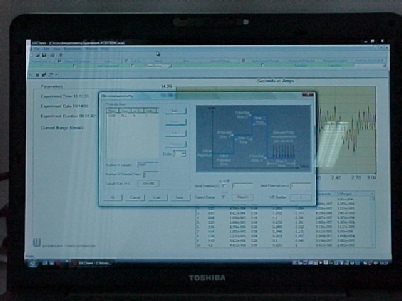 The system is controlled by a Laptop PC and FlowZF process development software. The following picture shows the mini FloPro zone fluidics research process analyzer system with UV/Vis detection in operation in PATLAB. This mini-FloPro is equipped with a milliGAT pump, 2 selection valves, a heated reactor and plumbed for zone fluidics and equipped to study a variety of chemistries. 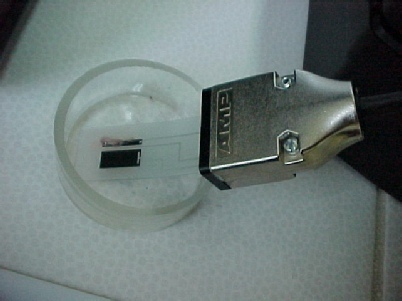 A bioanalytical Petit Ampere potentiostat is used for amperometric detection. 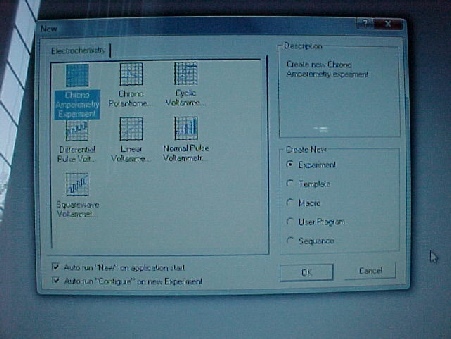 The system is controlled by a Laptop PC and FlowZF process development software. 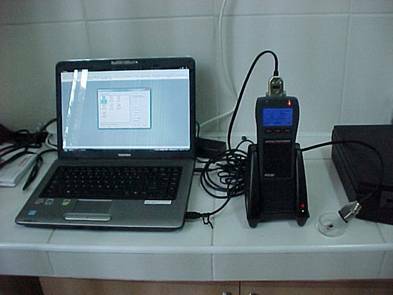 The following picture shows the mini FloPro zone fluidics research process analyzer system with amperometric detection in operation in PATLAB. 4. 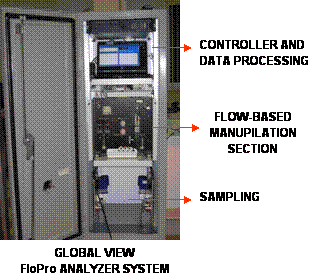 FLOWPRO-MINI-ZONE FLUIDICS PROCESS ANALYZER. FLUORESCENCE DETECTION. This mini-FloPro is equipped with a milliGAT pump, 2 selection valves, a heated reactor and plumbed for zone fluidics equipped to study a variety of chemistries. An Ocean Optics detector is used for fluorescence detection. Laptop PC and process development software. The system is controlled by a Laptop PC and FlowZF process development software. The following picture shows the mini FloPro zone fluidics research process analyzer system with fluorescence detection in operation in PATLAB. 5. FLOWPRO-MINI-ZONE FLUIDICS PROCESS ANALYZER. This mini-FloPro is equipped with a milliGAT pump, 2 selection valves, a heated reactor and plumbed for zone fluidics equipped to study a variety of chemistries. Global FIA FireFly detector for chemiluminescence detection is used. The system is controlled by a Laptop PC and FlowZF process development software. 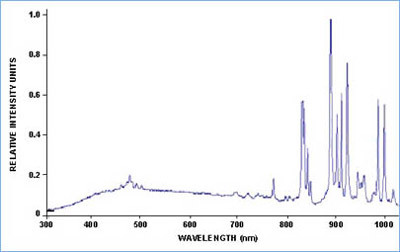 PATLAB is equipped with a QE65000 Scientific-grade spectrometric setup for fluorescence detection as outlined above. The different components in PATLAB is illustrated and discussed below. The HPX-2000 Xenon Light Source is a high-power, high-intensity source that is especially useful for fluorescence applications and for other applications where a high-intensity lamp is necessary. The 35-watt, short-arc lamp supplies a continuous spectrum from the UV through the NIR (185-2200 nm). The HPX-2000 features an integrated shutter that can be controlled via switch or TTL signal. Below is the spectral output of the HPX-2000 Xenon Light source. 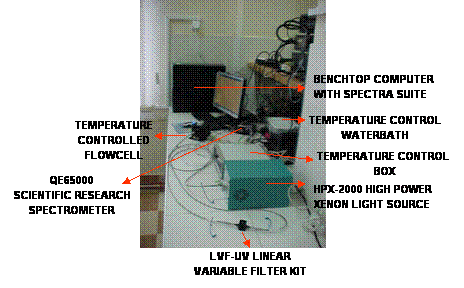 The double LVF-UV linear variable filters inside the UV In-Line Filter Holder (shown above) is optimized by the researchers in PATLAB in such a way by shaping the excitation energy from the single broadband HPX-2000 Xenon Light Source. Only the excitation energy necessary to excite the specific fluorescent sample is allowed to pass through and unnecessary energy is blocked. This is reflected by a spectral band with Spectra Suite at a certain wavelength for the fluorescent sample. The temperature-controlled cuvette holder outlined above with temperature control water bath and temperature control box is especially useful for fluorescence measurements that require stringent control of the sample’s temperature. Typical applications include protein and DNA thermodynamics, fluorophore characterization, enzyme kinetics and on-line thermocycling of biological particles. The QE65000 Scientific-grade Spectrometer is a very sensitive spectrometer. 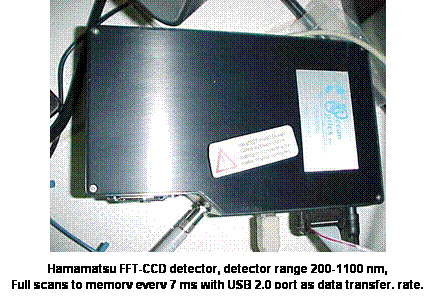 The Hamamatsu FFT-CCD detector used in the QE65000 provides 90% quantum efficiency (defined as how efficiently a photon is converted to a photo-electron) has a detector range 200-1100 nm, and full scans to memory every 7 ms with USB 2.0 port as data transfer rate. Breakout box compatibility: Yes, the BREAKOUT BOX is a passive module that allows multiple interfaces to a spectrometer such as: external triggering, GPIO, light sources, RS-232 interface and analog input/output. The following Figure is a COMPUTER SCREEN illustration of experimental results obtained in PATLAB with the SPECTRA SUITE software program. There is a HR4000 high-resolution spectrometer in PATLAB. The setup of the instrument is given above and the different components illustrated and discussed below. The DH-2000-BAL Deuterium Tungsten Halogen Light Source combines the continuous spectrum of deuterium and tungsten halogen light sources in a single optical path, producing a powerful, stable output from 215-2000 nm. The innovative DH-2000-BAL is the world's only balanced UV-NIR deuterium tungsten halogen source. The saturation and signal-to-noise problems associated with the D-alpha line in the deuterium source are eliminated by patterned dichroic filters as an innovation in light source technology to create the only combined-spectrum illumination source available. The DH-2000-BAL balances the intensity of the deuterium and tungsten halogen sources, producing a "smoother" spectrum across the entire wavelength range and eliminating problems associated with saturation. The CUV-ALL-UV 4-way Cuvette Holder for 1-cm path length cuvettes is equipped with fiber optic couplings at each of four quartz f/2 collimating lenses, which couple to optical fibers to either read or illuminate the sample. When used with Ocean Optics modular spectrometers and light sources, CUV-ALL-UV Cuvette Holders can measure absorbance, fluorescence, scattering or any combination of these optical phenomena. The HR4000 high resolution spectrometer has a 3648-element CCD-array detector from Toshiba that enables optical resolution as precise as 0.02 nm (FWHM). The HR4000 is responsive from 200-1100 nm, but the specific range and resolution depend on the grating and entrance slit choices. 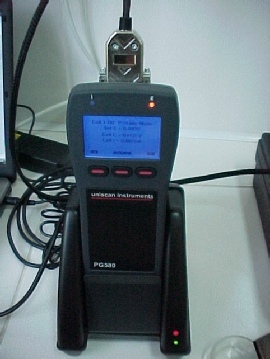 The detector has full scans to memory every 4 ms with a USB port as data transfer rate. There are 2 very well-equipped Uniscan mini-Potentiostats-Galvanostats in PATLAB. The PG580 is a high quality digital scanning potentiostat with excellent and very stable research laboratory performance. The response of the potentiostat is very fast making it an ideally suited device for real-time monitoring and control as required by PATLAB. The instrument has a friendly user configuration for advanced research innovative studies with remote control by a PC (labtop or benchtop) in a laboratory, as well as in-field on-site without PC control using an internal rechargeable battery. The research program of PATLAB with the PG580 includes various basic and applied research electrochemistry studies, surface electrochemistry studies with AFM/STM, flow-based real-time studies with PAT and NPAT, corrosion studies, studies on sensors, fuel cells research, electroanalytical and biomedical research. ● Battery Life: approximately 5 hours. Rechargeable NiMH cell. ● Display: Graphic LCD 160x100 pixels. Back light: Blue LED. ● Processor: Dual 16 bit H8S@18MHz. ● Data Acquisition: 16 Bits, > 100KHz. ● Rise Time: 1V/µsec. Into 1kΩ. ● Maximum current: ± 20mA. ● Maximum Measurable Current: ±20mA. ● Current Ranges: 1nA to 10mA in 8 decade ranges. ● Current Measurement Resolution 16 bits. ● Current Measurement Accuracy < 0.5%. ● I/E Input Bias: < 10pA. ● Applied Potential Range: ±2Volts. ● Applied Potential Accuracy: 0.2%. ● Applied Potential Resolution: 16 bits (61µV). 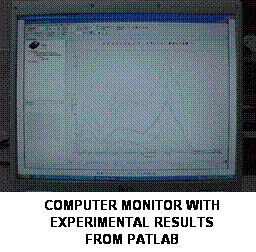 In PATLAB the experimental parameters and data display are implemented on a Labtop computer in powerful WindowsTM Software with full suite of electrochemical and corrosion techniques which provides full, detailed graphs, and filing of data objects. ● Cyclic and linear voltammetry. ● Normal and differential pulse voltammetry. ● User definable experiments via macro programming. ● Linear Polarization Resistance (LPR). ● Zero Resistance Ammetry (ZRA).